A new poster for the animated movie “The Tale of Despereaux” based on Kate DiCamillo‘s Newbery Medal-winning fantasy novel has arrived featuring the main character standing on a pumpkin while holding a needle like a sword. 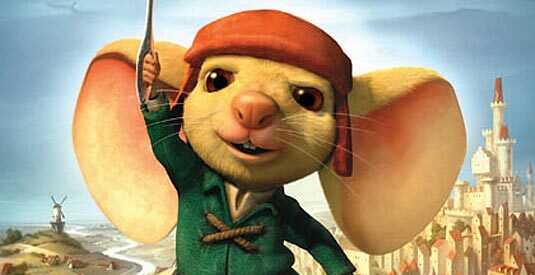 A brave and virtuous mouse, Despereaux is simply too big for his small world. 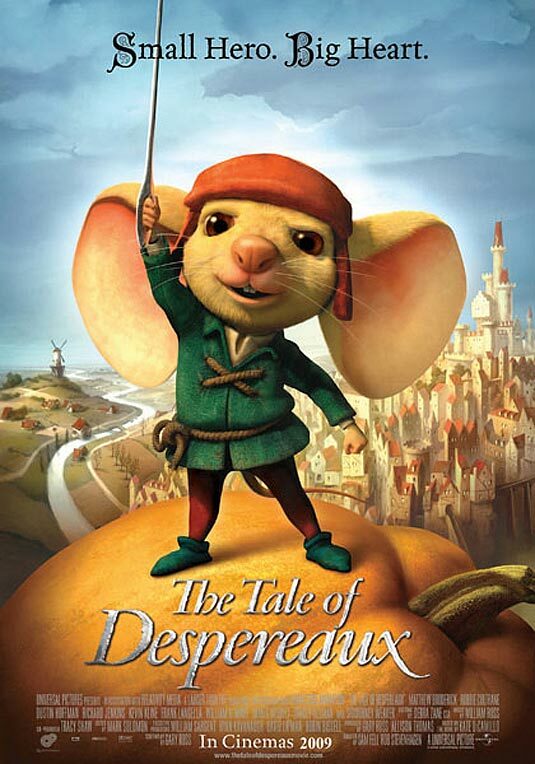 Though tiny, wheezy and saddled with comically oversized ears, Despereaux refuses to live a life of weakness and fear…believing he was destined to be celebrated in the tales of chivalry he so adores. When he’s banished from his home for not following the rules that society expects of a mouse, Despereaux befriends fellow outcast Roscuro, a good-hearted rat who can’t bear to look in the mirror and hopes to live far from the grim underground of his kind. While Despereaux begins his noble quest to rescue Pea–a princess who can’t see beyond her distorted view of the world–his pal Roscuro receives a painful rejection from her highness that sets him on a course of self-destruction. Along their parallel adventures, the two encounter colorful characters from a serving girl who wishes to be a princess to the evil leader of the sewer rats, who plots revenge on humans from his fiefdom in the subterranean shadows he relishes but Roscuro can’t abide. From the highest turrets of the glittering castle to the dankest dark of Dor’s sewers, friendships will be tested as Despereaux and Roscuro embark upon a journey that will change the way they look at their world–and themselves–forever. In this tale of bravery, forgiveness and redemption, one tiny creature will teach a kingdom that it takes only a little light to show that what you look like doesn’t equal what you are.